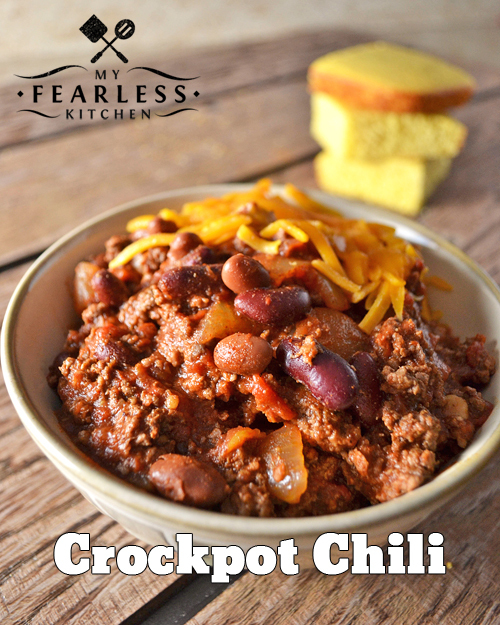 Whip up a batch of this Crockpot Chili to welcome in the chilly fall weather! It’s so quick to put together, and it smells so great simmering all day long. This recipe is another from my new favorite cookbook, “Slow Cooking All Year ‘Round” by Gooseberry Patch. I have yet to find a recipe in that cookbook that I haven’t loved! Start off by browning 2 pounds of ground beef in a large skillet, then put it in your slow cooker. (Or pull two pounds of your crockpot ground beef out of the freezer. Thaw it, and toss it right back in your slow cooker where it came from.) Then saute one chopped onion and some garlic in the same pan. Add that to the beef in the slow cooker. The beautiful thing about this recipe is that is the only “cooking” you’ll do! Add in some diced tomatoes (I use the less expensive, generic tomatoes for this recipe – here’s why), crushed tomatoes, kidney beans, chili beans, and some spices. Give it all a good stir, and you’re done! Well, except for the waiting part. This smells so good simmering all day long… It will be tough to resist grabbing a little taste if you’re home all day! Top with shredded cheese, sour cream, tortilla chips, cornbread, or whatever you like with your chili. 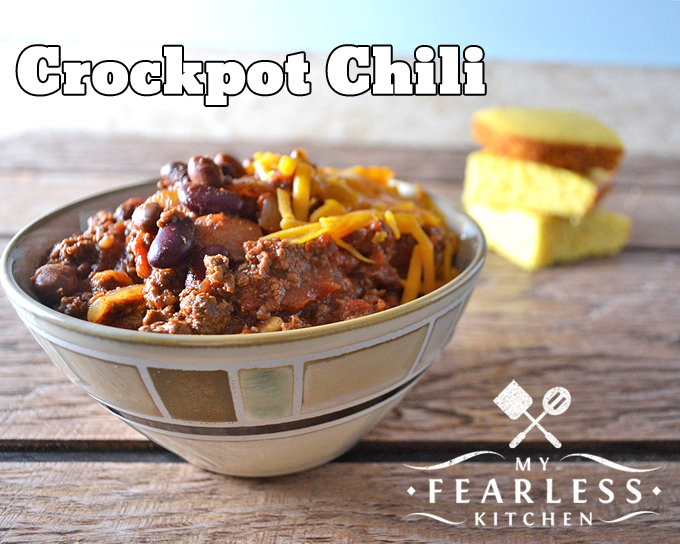 Whip up a batch of this Crockpot Chili to welcome in the chilly fall weather! It's so quick to put together, and it smells so great simmering all day long. In a large skillet, brown ground beef, drain, and add to a 6-quart slow cooker. In the same skillet, cook onions until translucent (about 5 minutes), then add garlic and cook for 1 minute more. Add to slow cooker. Add remaining ingredients to slow cooker, stir to combine. It’s real cool in Mantioba, too, so I made chili for my farmer, and am now on my way to speak to the Real Farm Wives of Indiana at the Midwest Farm Women’s Conference. Elaine, I won’t be able to make it to the Midwest Farm Women’s Conference, but I hope you have a great time and get to meet some of the Real Farmwives!